Robert Whittaker desperately wanted to fight at UFC 234 but an emergency surgery to repair a hernia ultimately kept him from competing on Saturday night. The reigning middleweight champion was forced out of his fight against Kelvin Gastelum just hours before he was scheduled to step into the Octagon to defend his title on home soil. Unfortunately, Gastelum was forced into surgery rather than competing and his management team released a statement on his behalf while he remains hospitalized. “On behalf of Rob, we would like to update his fans on his condition,” Whittaker’s management team wrote. “Last night at roughly 9 p.m., Rob began experiencing intense abdominal pains that were brought to the attention of the UFC doctors. After several hours of observation he was admitted to the hospital at 3 a.m. Rob is just out of a duel surgery for a twisted and collapsed bowel in addition to an internal hernia of the intestine and will be recovering in the hospital for several days. The timing couldn’t have been worse with Whittaker dropping out of the main event and no time to offer any sort of replacement to Gastelum on extremely short notice. 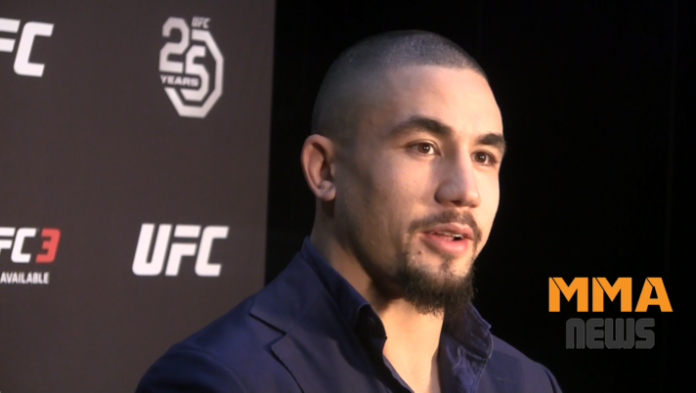 At this time, there’s no clear word on when Whittaker might be able to return but based on his surgery, it’s likely the middleweight champion will be sidelined for several weeks or possibly several months. As for Gastelum, he still showed up at the arena on Saturday night with a UFC title belt on his shoulder proclaiming that he was now the champion since Whittaker was unable to compete. As of now, the UFC has not announced if they plan on trying to rebook Gastelum against Whittaker or possibly have him face a different opponent if the champion will be out of action for a prolonged amount of time. With Whittaker vs. Gastelum cancelled, the UFC shifted the fight between Israel Adesanya and Anderson Silva to the main event spot.